The newest attraction at Legoland Florida Resort, The Great Lego Race virtual reality (VR) coaster, is now open! This new coaster invites guests into a virtual world where they are the star of a race against several other minifigures while taking a wild ride on a roller coaster. While wearing optional VR headsets as they ride the roller coaster, guests can experience the point of view of a Lego race car driver as the action happens in every direction – all in an environment where everything is made of Lego bricks. This wacky race pits guests against a Lego wizard, surfer, pirate, trendsetter and pharaoh driving vehicles like a stylish scooter fueled by espresso, a rocket-powered windsurfing rig, and a canopied bed called a “litter” carried by mummy servants. The adventure starts when guests step through the attraction’s new entry portal, featuring giant versions of minifigure racers and their Lego vehicles. The queue is filled with graphics that represent each of the five racing teams, along with themed elements and video screens to entertain riders as they wait. Once guests are aboard the vehicles, the visuals are synched with the coaster’s twists and turns, creating a brand-new experience filled with action and humor. 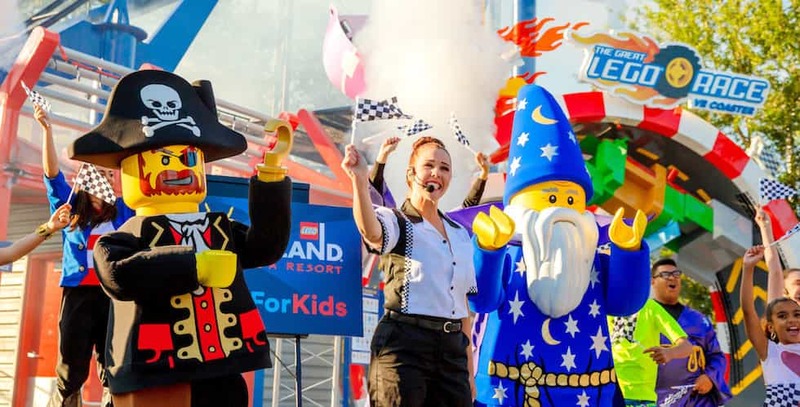 The Great Lego Race is the first VR coaster experience designed for kids, and is the first time the Lego brand and its minifigure characters have been integrated with this technology in a theme park attraction. A preview of the experience can be found on MackMedia’s Coastiality mobile app for iOS, Android and Oculus devices. For more information on The Great Lego Race and Legoland Florida Resort, visit Legoland.com/Florida.